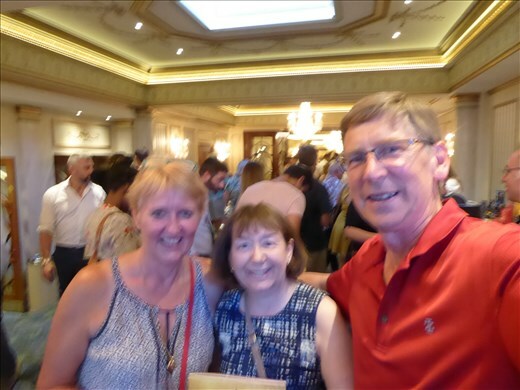 Ian, Carol & I at Hamilton!! Again, a lazy morning, doing English things like drinking tea. Headed out to meet Ann and Michael at Trafalgar square. We were joined by a few of the crew including (unexpectedly) Jocie. We headed to St Martins in the Fields – a fully functioning church where you can have lunch in the crypt – something a bit different. We then all wandered down past the Horse guards and Downing street. The others then went on and we stopped at Churchills War Rooms – an underground bunker that allowed Britain's leaders to plot the allied to victory during the WWII. It is a labyrinth of rooms and corridors that are below Westminster, designed to protect Churchill and his war cabinet from the German bombing raids. It now houses the Churchill museum which cover the story of his life and legacy. Then off to meet Carole for tea before heading to Hamilton. Got to the Palace theatre early – thankfully. The queue was out the door and round the block. There were security checks and a bomb dog wandering through the crowd. Negotiated that and managed a nice glass of Veuve Clicquot before the performance. The theatre itself is beautiful and we had great seats. I have been looking forward to this for a while and it did not disappoint. Absolutely brilliant – we all left there buzzing. Came home and had to put the soundtrack on.